Are You Marketing Like American Cheese? I love cheese of all kinds except the Pasteurized, Processed yellowish Cheese Food gunk that we here in the USA call “American Cheese”. In my country this stuff, which is mass-produced in a factory, is often sold in individually packaged slices and is what McDonald’s puts on their Big Mac sandwiches. It’s as far from delicious natural cheeses like Gruyere and Brie and Cheddar as a my bike is from a 1961 Maserati 3500 GT Spyder by Vignale. It seems to me that many people are marketing like American cheese. They dumb down their ideas, their organization, and its products and services into generic waffling that’s so bland and boring that it says absolutely nothing. Most people reading this create and market niche products. If so, you don’t serve the the masses, so don’t market to the masses! Instead think of your marketing like your favorite cheese. What’s unique? What are your customers really buying? How can you be interesting and fun and exciting? For me it would be the wonderfully nutty flavor of an awesome Swiss Gruyere. I love the difference in texture between the hard natural Gruyere rind that protects the delicious inner earthiness of the cheese. Right now I am imagining the tanginess of a chunk of Gruyere on a piece of crusty bread followed by a sip of beautifully crisp Veuve Clicquot Champagne. And I’m thinking of how great it would be to roll an 80-pound wheel of Gruyere into a big party to make cheese fondue to share with a big gang of my friends. 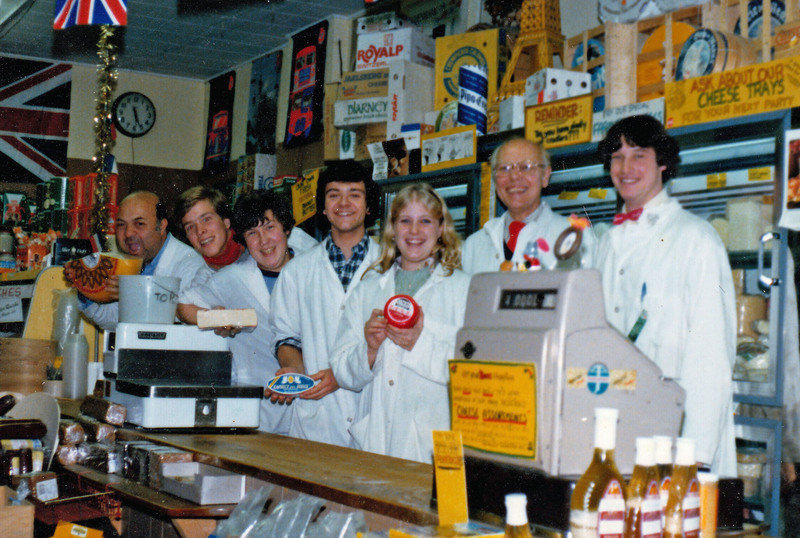 Fun fact #1 - When I was in High School I worked in a Cheese Shop! That’s me on the right in the photo below. 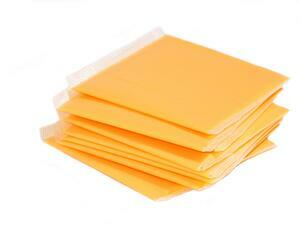 Fun fact #2 – Food laws in the USA categorize processed cheese based on the amount of real cheese that is present. While the formula is complicated, the more words in the fine print description of the “cheese” on the packaging, the farther away from real cheese it is. So if you see something like “Processed Cheese” it’s sort of like cheese. But if it is labeled something like “Pasteurized, Processed Cheese Food Product” you’re basically looking at something closer to plastic than to natural cheese. 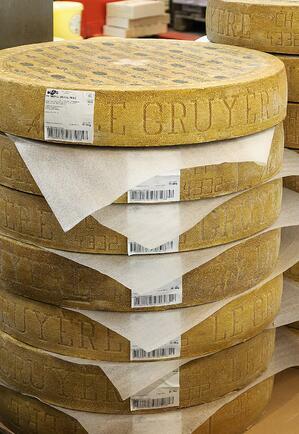 Rounds of Swiss Gruyère cheese on sale in the Rungis International Market, France by Myrabella via Wikimedia Commons.